This year for Father's Day we decided to treat Dad to a delicious dinner, so I began brainstorming recipe ideas using some of his favorite foods. He is a huge fan of fish, but I decided to branch out from our usual salmon, and go with a nice halibut dish. 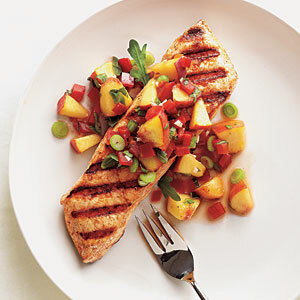 I often like to pair grilled fish with a fresh salsa using various combinations of fruits and veggies, and was pleased to find a recipe for Grilled Halibut with Peach and Pepper Salsa in the June issue of CookingLight Magazine. I've used peaches and peppers in combination before, but I was intrigued by the addition of chopped arugula and oregano -- different flavors than my traditional lime juice and cilantro. To go with the halibut I wanted to find a unique grain dish -- some type of salad using bulgar or barley. I found two versions of a wheat salad with pistachios in CookingLight: Cracked Wheat Salad with Nectarines, Parsley, and Pistachios, and Wheat Berry Salad with Raisins and Pistachios, and took elements from each to create my own dish: Bulgar Wheat Salad with Fresh Cherries and Pistachios. The final component of this meal was grilled brussel sprouts, which is not a frequent visitor to our table, but a veggie that my Dad enjoys (as do I) so I decided to include them as a simple side. Combine lemon juice, oil, paprika, garlic in a low glass baking dish and stir with a whisk. Add fish to dish, turn to coat. Cover and let stand 15-30 minutes. Remove fish from marinade, place on grill coated with cooking spray. Grill 3-5 minutes on each side. Serve with salsa (recipe below). Combine ingredients and let stand 30 minutes before serving. Combine bulgar and 1 cup boiling water in large bowl. Cover and refrigerate for 1 hour. Preheat oven to 350. Place pistachios on baking sheet. Bake for 8 minutes, stirring once. Cool slightly and chop. Combine olive oil, lemon juice, honey, coriander and ginger in a small bowl, stirring with a whisk. Combine dressing with bulgar and 1/2 cup cherries. Add nuts, 1/4 cup green onions, and cilantro to bulgar mixture. Wash and trim brussel sprouts and soak in salt water. Combine sprouts with olive oil, lemon juice and seasoning. Grill until browned.